Even with the best laid plans, you will occasionally find yourself having to prepare a meal that you haven’t planned for. Maybe you didn’t make it to the grocery store. Or your significant other has been… but brought back the wrong ingredients. 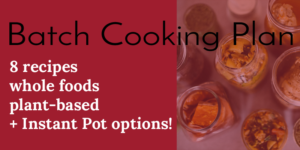 Or you are trying to use up various ingredients that might otherwise go to waste. You don’t have to throw the towel and order in! 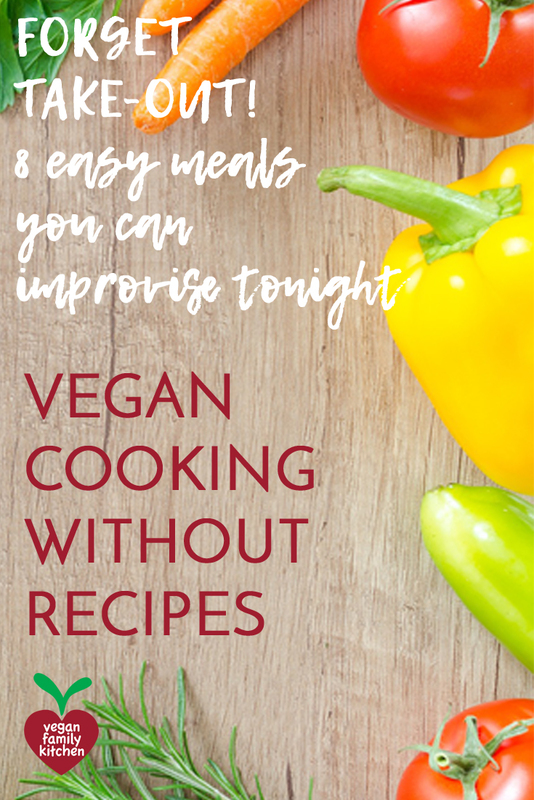 Knowing how to do vegan cooking without recipes will save you from processed food and expensive restaurants tonight. Plus, your meal will likely be a lot healthier, there will be no mountain of throwaway containers, and it will be just as fast anyway. The key to culinary improvisation is to start with a standard dish then use the compatible ingredients you have at hand. Fear not: your combinations may be unusual, but it is unlikely that you will completely ruin the meal (unless you lose control of one of the following: salt, hot pepper, and heat from the oven/stove). Combine grain, protein-dense ingredient (beans, tofu, fake meat…), 2-4 vegetables, 1 fruit (optional), sauce and crunchy topping (nuts, seeds, sprouts). Sauté some onion, garlic and veggies and/or beans, then deglaze the pan (that means detaching the caramelized bits from the bottom and mixing them in the sauce) with a little bit of broth, white wine, balsamic vinegar or pasta cooking water (in a pinch). Add herbs, toss and enjoy! Really need a sauce? Try my vegan bolognese or maybe some pesto? In oven-safe pot with tight-fitting lid, sauté onion, veggies and beans (not too much – rice’s the star here), add rice and stir. Add broth (1:3 ratio for Arborio and white rice, 1:4 for brown rice or barley). Bring to a boil then cover and bake in oven at 350F for up to an hour. Monitor after 40 minutes to check doneness of rice. Stir vigorously for 3-5 minutes, adding in some chopped nuts and/or herbs if desired. No Dutch oven? prepare on stovetop then pour in oven-safe dish, cover tightly with foil. Cook protein-dense ingredient (tofu, tempeh, fake meat…) first and reserve. Sauté onion, garlic, ginger and vegetables one at a time on medium heat. Add seasonings and sauce and bring to boil, lower heat and reduce liquid a bit. Add reserved ingredient, reheat throughout and serve over rice, noodles, etc. Sauté onions, garlic, seasonings, vegetables one at a time. Deglaze with apple cider vinegar, balsamic, white wine or lemon juice, then add lots of broth or water in a pinch. 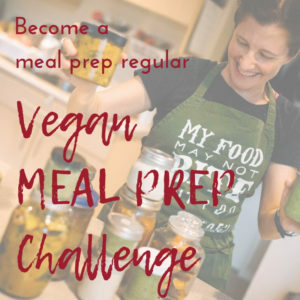 Add extra protein (beans, lentils, diced fake meat…) and/or grains (rice, orzo, broken-up lasagna or spaghetti, quinoa…) and cook until everything is done. Add dark leafy greens in small pieces if available and let wilt. For creamy soup, cook vegetables in broth then blend before adding extra proteins or grains. Read more on making soup tasty. Rediscover what pizza should really taste like and make vegan pizza at home! Also a great way to use leftovers. Assemble the night before and bake before dinner. In oven-safe dish, combine 2 cups bize-sized veggies (fresh or frozen) with 1 cup cooked protein-dense food (beans, fake meat…) and 1.5 cup starch (cooked noodles, small-dice potatoes, cooked rice or barley…). Stir in something saucy (about 1.5 cup) and ¼ to ½ cup bonus ingredients (chopped olives, nuts, sundried tomatoes…). Top with breadcrumbs, crumbled crackers or chips, and/or vegan cheeze, bake at 400F for 40-50 minutes until bubbly and lightly browned. 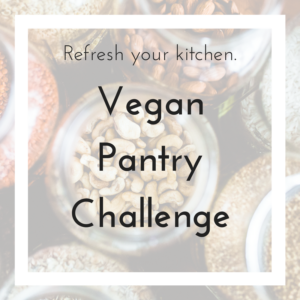 Lay out spreads (hummus, cashew cheese…), cut veggies and/or fruits, cooked beans or baked tofu, and crackers or toasted bread on a plate. Even better if you have olives or marinated peppers. 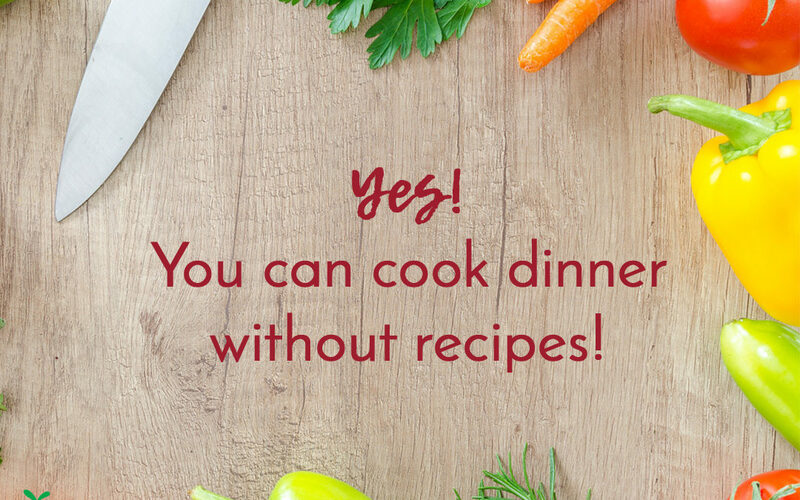 What’s your go-to, easy-to-cook, no-recipe meal?